7105 E. 38th Street front elevation image. Buyers still have time to select exterior paint. Open layout for entertaining. Split bedrooms for privacy. A few minutes by car to the shops at Dawley Farm Village, parks, and golf. 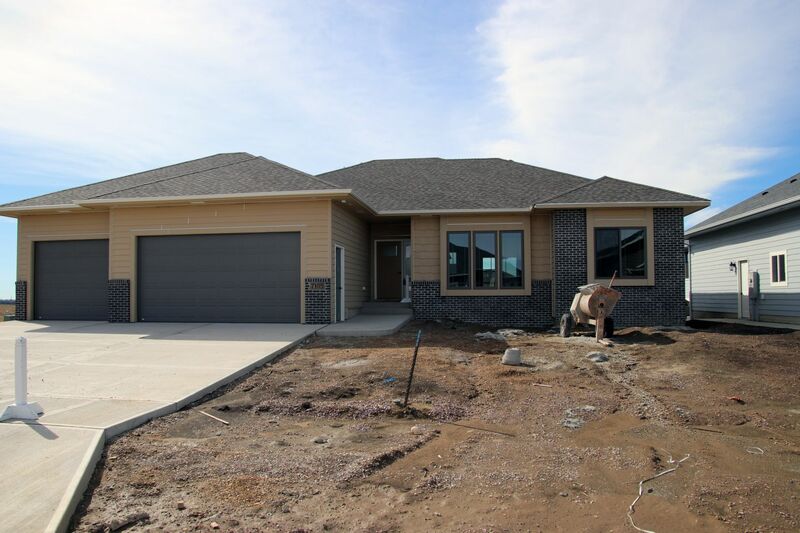 Everything under one roof in this custom designed ranch home in Copper Creek Heights in eastern Sioux Falls. The open floorplan boasts natural light with a coffered ceiling that livens up your living room. The kitchen is at the center of your “Great Room” featuring polished granite tops, Ragno subway tile backsplash, Cherry cabinets in a greyish “Slate” along the perimeter and dark “Java” for the island, and walk-in pantry. Calico Maple hardwood floors and “greige” painted walls run throughout the home’s interior. Your private master suite, secluded from the other bedrooms, includes double vanities and a walk-in tile shower with a mix of large ceramic tiles in a metallic grey “Antracita” and glass mosaic tile in “Colosseum Night”. Other features include a covered deck, 3-stall garage with floor drains, and landscaped yard and sprinklers.